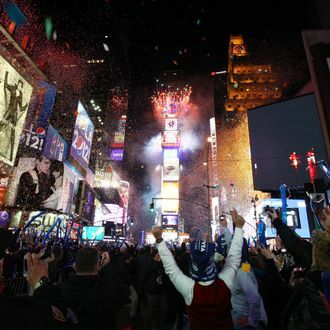 People from all around the world will be congregating to celebrate the arrival of a new year — which is stressing out law enforcement everywhere, especially given ramped-up fears after the attacks in Paris. No one will be able to bring backpacks to Times Square. London plans on keeping its fireworks but will also deploy 3,000 police officers to the festivities. In Madrid, the metro station at Puerta del Sol — where thousands of people usually celebrate New Year’s — will be closed today and tomorrow. According to Deutsche Welle, “backpacks, bags, suitcases, folding chairs, glass bottles, fireworks, megaphones, and laser pointers” have all been banned from festivities near the Brandenburg Gate in Berlin. Security is tight in Morocco, too, a country that depends on tourism revenue — and hasn’t dealt with an extremist attack since 2011. On Wednesday, Turkey arrested two alleged Islamic State militants who were believed to be plotting a bombing in Ankara this week. After Christmas, Austria warned its neighbors that a “friendly” intelligence service told them about a possible attack — a shooting or bombing — in European capitals before the end of the year. In Pasadena, security has also been beefed up in preparation of the Rose Bowl and Rose Parade, where “federal personnel will be employing a variety of explosive-detection methods, as well as at key venues across the city from bomb-sniffing dogs to sophisticated devices that register even minute amounts of radiation,” according to a DHS special agent in Los Angeles, per CBS News. As in all of the other places mentioned above, there have reportedly been no credible threats. In Bangladesh, however, the U.S. embassy has been warning about possible attacks against hotels, per CNN. In Dhaka, the capital, outdoor parties will be banned tomorrow night. In other news, Donald Trump is helping host a New Year’s Eve special, and it costs more than $100 to celebrate the arrival of 2016 with an extra helping of Donkey Sauce.